STUNNING MISSION HILLS HOME WITH SWEEPING VIEWS OF MISSION PEAK! THIS FANTASTIC HOME SITS ON A 1/3 ACRE LOT AND OFFERS A “LAKE TAHOE” FEEL AND SETTING! Step into this beautiful Mission hills home and you will appreciate its open floor plan with vaulted ceilings and beautiful features. It is perfectly located on a 1/3 acre lot and provides stunning views of Mission Hills! feet of living space. This lovely home consists of 4 bedrooms and 3 full baths and also offers a bonus rooms downstairs! A gorgeous chef’s kitchen awaits to offer endless hours of enjoyment! This beautifully remodeled gourmet kitchen features granite countertops , Oak custom cabinets, Jenn Air Electric Range Stove, Kitchen Aid Appliances, Stainless Fridge including a wine fridge! Spacious family room with soaring vaulted ceilings and a cozy fireplace offers sweeping majestic views of Mission peak as well as large front balcony. A tastefully designed Stone fireplace allows for cozy evenings during the winter. Walk into the generous master suite which offers natural light, high ceilings, and a walk in closet. A traditional master bath offers dual vanity sinks, separate shower and jetted tub as well as a sauna! Location, location, location! 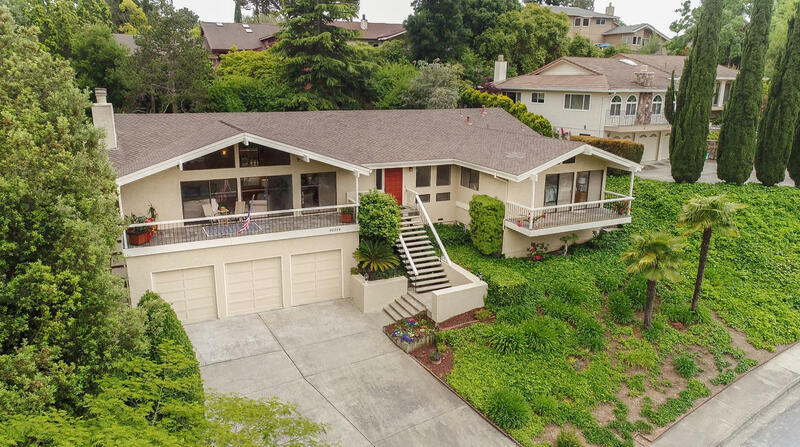 This home is in close proximity to the I-680 Freeway, I-880 Freeway, and 2.7 miles from the new Warm Springs BART Station.